In the later part of the 1950’s Peter was introduced to the 750 Motor club by way of an 750 sports car he had built that utilised Austin Seven components. The car was very competitive against and beat the J2 MGs. 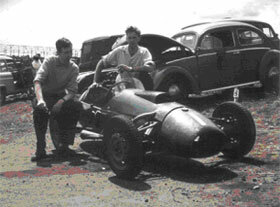 When the 750 Motor Club introduced a new 250cc single seater Class, Peter became interested and still having retained the main drawings that had earlier been offered Paul for the 500cc MK2 car back in 1952, he decided to construct a car. 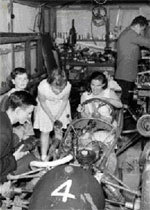 Peter calculated that by using a re-stressed space frame of smaller diameter tubing and his favoured combination of front wheel drive with a swing axle rear, a 250cc car could be constructed of less than 300lbs which, assuming that he could get near 30BHP from a tuned up Velocette MOV would give good power to weight ratio. He also considered it would be a project that would allow him to prove his theories and that could easily be funded from his current salary. Peters theory behind swing axle in combination with front wheel drive was that a light weight vehicle with more than 70% of the weight in the front, the rear end will be very low in kinetic energy desiring near perfect tire adhesion. On an un-powered swing axle suspension not using wide slick tires, maintaining a negligible track change is a high priority. No other system could be configured to achieve the same strength to weight ratio and provide negative roll camber as a bonus. In addition the pivot point of the rear axles can be made so low, no more than three inches on a car of the 250’s weight, that the track change at ground level due to suspension movement will be effectively less than almost any transverse link system. It also permitted the suspension strut arrangement to resist roll, thus maintaining ride. This was important as it meant that it would allow a reduced anti-roll requirement at the front. 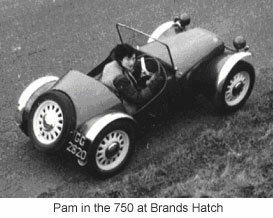 The car was duly constructed, however during testing of the 250cc car just a week out from its debut race at Brands Hatch, the car sustained extensive chassis damage as a result of having hit a telegraph pole. Paul offered to help with the repairs on the understanding that he be allowed to drive it and despite Peters consternation and concerns, had little option but to enlist Pauls help if the car was to make the meeting. 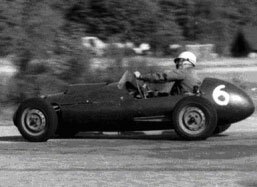 At the event the car easily lead the race from pole, however a rear radius arm which had probably sustained damaged in the testing accident failed and although holding the two halves together with one hand, Paul still easily continued to lead but was ultimately black-flagged and forced to retire. The 250 was a most successful car, going on to win the 1959 and 1960 250 cc championships, in total winning twenty four races and hill climbs and was never to be challenged. The cars success was unfortunately also instrumental in killing off the 250 formula. 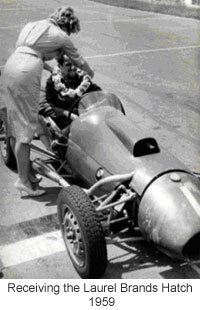 The car achieved its crowning glory, competing magnificently in a 500cc class race at Brands Hatch. Despite a good qualifying performance, the car was required to start from the back of the grid for regulatory requirements, yet was third into paddock after the start and easily held the position for four laps until the spring clip holding the carburettor needle broke, allowing the fuel mixture needle to drop down shutting off the supply. A comment on the progress of the race from the drivers seat may be of interest. The car started from the inside back row of the grid, had better acceleration than some that were in front of Peter, who in anticipation had positioned the car at a slight angle hoping to squeeze down the middle, which he did and straight through to third, well before reaching Paddock. Staying behind the two leaders down the hill and backing off entering Druids, Peter tried to get through on the inside, but in being squeezed onto the outside of the left hander by the leaders was forced to back off and in doing so lost a little on the gradient up to Clearways. The car was much quicker around Clearways itself and right on the two leading cars tails at the start of the straight and would be able at some stage be able to pass them, one at a time if they continued to drift wide coming out of Druids. Alas on only the third occasion in the 250’s career, calamity struck when the needle broke. 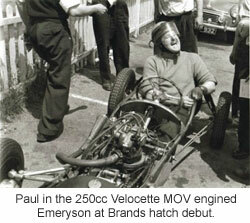 Peter in the 250cc Velocette MOV engined Emeryson at Eelmore. All in the workshop. L-R John Farley, Peters mechanic, Peters son, daughter Susan and wife Jeanne and Peter at the rear. 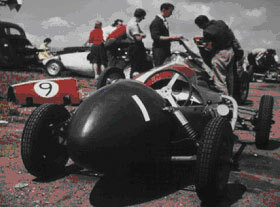 Soon after success of the 250 design had become evident, Paul contacted Peter asking if he still had the drawings of the prototype 500cc car that had been shown him. 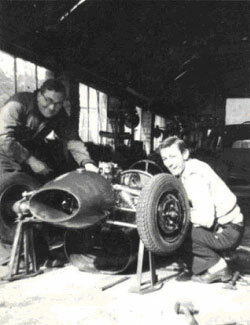 An American Robert Danken had made enquiries with Paul about supply of a 500 F3 car and if Peter was interested in building his design for him he should phone him straight away. 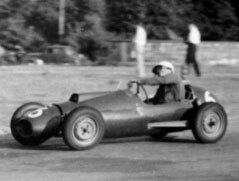 As the 500 formula three was on the wane and had been replaced by the now successful Junior Formula, Peter persuaded Robert Danken that a Formula Junior car was the way to go instead of 500cc formula three. Getting agreement Peter set about updating the design. In the same way the 500 design had been re-configured for 250cc formula there were few changes required to make it larger for the new Formula Junior with even the body looking remarkably the same as the earlier 250cc formula car. It was about this time that Peter set up my own company producing light alloy bi-metal brake drums to fill a much needed gap. These brakes were supplied to the Likes of Eric Broadly for some of the Lola Formula Junior, Colin Chapmans Lotus 20 FJ used these on the rears, Audi Sports saloons along with Peters Elfin Formula Juniors and others such as Brittania and Tojeiro.